1. 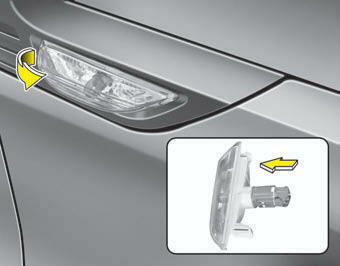 Remove the light assembly from the vehicle by prying the lens and pulling the assembly out. 2. Disconnect the bulb electrical connector. 3. Separate the socket and the lens parts by turning the socket counterclockwise until the tabs on the socket align with the slots on the lens part. 4. Remove the bulb by pulling it straight out. 5. Insert a new bulb in the socket. 6. Reassemble the socket and the lens part. 7. Connect the bulb electrical connector.